There's a widely-held view that agile development is new. But agile was used decades before it became well-known. For example, software was developed in half-day iterations in 1958 for Project Mercury, the United States' first human spaceflight program. And Harlan Mills of IBM promoted in 1968 that "software development should be done incrementally, in stages with continuous user participation and replanning." While agile is not new, many innovators and visionaries have advanced agile over time. 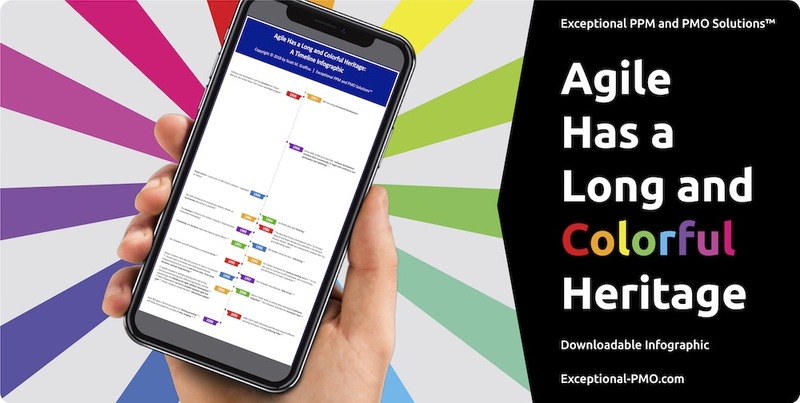 Agile Has a Long and Colorful Heritage: A Timeline Infographic from Exceptional PPM and PMO Solutions™ illustrates via specific examples how agile has progressively evolved since (at least) 1957. For more information on agile—and the most popular agile framework, Scrum—visit https://AgileScrumGuide.com/blog/.